Harrigan Papers: John B. Slater letter to Harrigan about the Ben Williams, the Pettengills, Young & Ide stables, and famous geologist Clarence King 16 April 1926 Page 1 You can obtain high resolution copies of this image from the Jim McMillan Research Library at the Stevens County Historical Society Museum, 509-684-5968 or email schs@ultraplix.com. You can obtain high resolution copies of this image from the Jim McMillan Research Library at the Stevens County Historical Society Museum, 509-684-5968 or email schs@ultraplix.com. 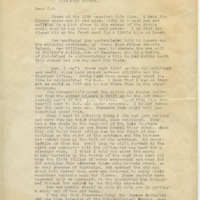 “Harrigan Papers: John B. Slater letter to Harrigan about the Ben Williams, the Pettengills, Young & Ide stables, and famous geologist Clarence King 16 April 1926 Page 1,” Crossroads Archive, accessed April 19, 2019, http://crossroadsarchive.net/items/show/15245.